Ben wakes up in the middle of a chasm, where Abraham Lincoln, Ben 23, Zac Efron, Steve and Ahmad and him are tied around a giant bear. Abraham Lincoln: Well, young lad, this is yet another mystery in the mysteries of the wide universe, and a rather popular strategical plot element administered by the writers to compensate for a rather imbecile failure for a decent commencation. Steve: I heard, "Bla Bla Bla Bla Industrialization Bla Bla Bla Big Words Bla Bla". He hugs Abraham Lincoln to death. Ahmad: I'm surrounded by morons. Earlier, Ben is asleep. His alarm beeps, and he gets up. Ben: Ah! Another normal day! But no! He looks around. He leaps out of the building, and lands in front of a lot of snow. He transforms into Articguana, who is somehow wearing a scarf. Articguana: And let there be snow! He fires a beam of ice at the sky, and it begins to snow even more. He then creates an ice board and surfs off. He fires ice beams left and right. Mr. Bauman is next to his chimney, holding a cup of hot cocoa. Mr. Bauman: Ah. Nothing like a calm Christmas day with warmth and no Ben to be annoyed from..
Articguana's ice beam enters the room, and freezes it, including Mr. Bauman who shivers coldly. Mr. Bauman, shivering: B-B-B-B-EN TEN-NYS-ON!!! Articguana's ice beam enters, and freezes solid the generator, causing it to overload. Pakmar: AHH!! CURSE YOU, BEN TENNYSOOOOOOOOOOOOOOOOOOOOOOOOOON! The factory explodes. Meanwhile, Articguana arrives at Max's Plumbing. Articguana ( ): Aha! Time to spread the Christmas cheer inside! He pulls the lever, and slides down all the way in the base. He releases a wave of ice, freezing everybody, including Max, who is frozen into a rage stature, and Rook, hardened into confusion. Dr. Animo is trying to add a burning coal to his cell door to open it, but the freeze wave cools it down. Dr. Animo: CURSE YOU BEN TEEENNNNNYYYYSSSSSOOONNN!! Articguana: Oh look, everyone's frozen. He's a kid and he wants to have fun! But when you need a superhero, he'll cower off and run! Despite the muscles he's got on his arm! He'll fall like a hollow sack from the littlest harm! He'll hide in any vase! He'll never cease to whine! Ben, Rook, Gwen, and Kevin are doing their Christmas shopping at the mall. Kevin is lifting a huge ammount of stuff. Gwen: Uh, Ben, are you really sure we need all this stuff for Christmas? Ben: Absotively Positutely! We have only reached the begining of the things we need for Christmas. He pulls out a small paper, and unfolds it into a huge scroll. It keeps getting rolled down, and extends out of the mall, down the stairs, into the garage, out into the street, into Ben's house, and outside of the Galaxy. The gang all have white beards now, even Gwen. Ben: a bikini bottom reference chocolate bar, a rotten meat steak, and a toilet. He points at a nearby plumbing shop. Kevin faints, the entire pile of stuff crushing him. Gwen: Um.. What do you need the toilet for? He slaps down the Omnitrix, transforming into Wildmutt. He runs up and begins drinking from the toilet. Rook: I must commit suicide to escape this eternal tormentation. Wildmutt looks up at the camera and grins, a piece of poop on his face. Wildmutt: No one is capable of analyzing my interests. Kevin gets up, from all the presents collapsing on him. Kevin: ...did Wildmutt just talk? Gwen: Ben sure is full of surprises. Wildmutt is scratching himself with his back leg, and fleas and insects fall out. The flea is stepped on. Gwen: Well, for a Christmas random special, there is very few Christmas foreshadowings. Zs'Skayr breaks out of the Omnitrix, and flies out, lightning striking in the distance, and darkness engulfing everywhere. Zs'Skayr: I SHALL BRING FORTH THE SHADOWS!! Gwen: Uhm... No.. Let's leave that plot for the Halloween special. Zs'Skayr: MY NAME IS ZS'SKAYR! He explodes into teddy bears. Then suddenly, an Elf appeared! Elf: Ben Tennyson! I need your help! Elf: Santa is in trouble! He is captured! Then, suddenly, three figures appeared! Figure #1: We're here to help! Ben: Who are you guys. Figure #1: I'm Abraham Lincoln, and these are George Washington and George Bush. No, wait, you fools! You are not supposed to appear yet! Georgge Washington had a snake in his underwear. George Bush had breast cancer, and he cried so hard that Megan Fox gave him an explosive lolipop for Thanksgiving dinner. Abraham Lincoln didn't die because I like him. Abraham Lincoln: Gratitude. I appreciate that. Ben hugged Rook to death. Figure #1: No, you idiot! I'm Ahmad! Figure #2: And I'm Steve! Ben: Then, who's Figure #3? Abraham Lincoln: That's Ben 23. Kevin: But wait, isn't that a bit too much main characters? Kevin died of breast cancer. Ahmad: Well, Gwen's heart is cursed to be frozen. Ben: Lol Gwen's heart is frozen. Steve: LET IT BEN! LET IT BEN! Ben: So how will we cure her? Ahmad: Only an act of true love can thaw her heart! Gwen turned and kissed a bystander on the lips. He kisses Gwen full on the lips. She cursed him to never be able to eat ice cream again. Ahmad: Anyways, we can go to some magicien to cancel the spell. It'll work just fine. Hex is good now. Ben: Naaah! Where's the fun in that? Ben: Yeah, think of something else. Steve: We can go to Santa and wish for Gwen to be unfrozen! Yeah, and we can even have Santa be captured to make the plot richer! Ben 23: Dibs on that idea, baby! Steve: Oh yes he does! Ben 23: We'll prove it when we're there! Ahmad: But by the time we get there, Gwen would've DIED. Ben: Nonsense. Who's up for smoothies? He turns into XLR8 and races off. Ben transforms into Jetray, and Ben 23 turns into Speedyquick to follow him. He transforms into Fasttrack, and dashes after them. At Mr. Smoothy's, Ahmad is sitting on a chair, tapping the table, bored. Beside him, Gwen sighs. Ben 23, Ben, Steve are still slurping their fifty-sixth smoothies and are not planning on stopping just yet. Ben 23: So I said, I eat chumps like you for brunch! Ahmad: Oh for God's sake! We're already late. Gwen's gonna die! Ahmad: the hell...? Do you mean, "exaggerate"?! Appa, from Avatar: the Last Airbender, appears. He jumps on Appa, along with Gwen, Steve, Ben 23, Ahmad, and Abraham Lincoln and they left Rook and Kevin's bodies to rot with Selena Gomez's ex-boyfriend Muhammad Ali Klay and Sandra Bullock. Abraham Lincoln: It is a matter of continuuating time streams. Steve: lets sing christmas songs! Steve: No, wait, I know! Let's make Appa Christmas-y! Appa gains reindeer stuff and a sled. Steve: Jingle bells, jingle bells! Jingle all the waaaaaaaaayy! Ben falls through a portal. Gwen: Oh look, Ben fell. Ahmad: Who cares. Its not like he's a main character or anything. Gwen: Yeah, he can handle himself. Meanwhile, Ben teleports back in his bed. Ben ( ): Huh. Where am I? I don't feel so sleepy. She appears next to Ben. Charmcaster: Because you have been such a jerk in Christmas, I will send you to see the Ghosts of Christmas Times! Ben: Wait wut. I'm not a jerk. 2-year-old Ben with a diaper steals 2-year-old Gwen's presents. 5-year-old Ben blows up Mr. Baumann's Christmas Tree. Mr. Baumann: CURSE YOU, BEN TENNYSON! 10-year-old Ben kills Pakmar's Christmas gifts brought to his children. Pakmar: CURSE YOu, BEN TENNYSON! Ben: Lol maybe a little. Charmcaster: Anyways, now you will meet up with, GHOST OF CHRISTMAS PAST! Ben 11: I am the Ghost of Christmas Past! Ben: Seriously? You look nothing like a ghost! 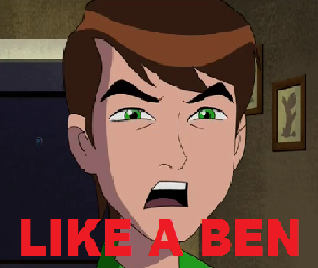 Ben 11 growls, and transforms. He opens his body, revealing his tentacles. Ben screams like a girl. Ben: AHH! TURN BACK! TURN BACK! Ghostfreak snaps his fingers, and his body closes. They teleport in front of an elementary school. 10-year-old Ben comes out, and he screams. Ben 10: YAY! CHRISTMAS BREAK! Ben 11: You never were a fan of friendship, love and sharing. Ben 10 sees a santa Claus wearing guy nearby selling cotton candy. He walks over, and transforms. Grey Matter crawls up Santa's skin, and he begins to itch. Santa Claus: I feel- AAAACHOOO! Grey Matter appears beside the explosion. Ben: hehe good times good times. Ben 11 explodes into teddy bears. The teddy bears transform into UA Ben. Ben: I am the Ghost of Christmas Present! He blows up UA Ben. Besides, if he dies now, you can't exist. An image appears behind them, where 15-year-old Ben is sitting, eating a muffin. Suddenly, a Highbreed Christmas Tree appeared, and DNAliens began to sing Jingle Bells. Ben 15: AHH! CHRISTMAS SONGS! #*%&^$**^#&^$!*!!!! Abraham Lincoln: I am deducing that it is indeed a poor excuse for a censored curse word. Ben 15 transforms into Way Big, who steps on everything. UA Ben explodes into Atomic-X, who creates a powerful nuclear Omnipotent wave. Ben 10K: I am the Ghost of Christmas Future! Ben 10K: I'm here to show you what Christmas will be like in the future! Ben 10K teleports himself and Ben to ze future. Ben 10,000 from OS as XLR8 is fighting bad guys. His phone rings. Kenny, in the phone: Dad? Where are you?! I need your help! I can't go to the bathroom alone! XLR8: You're 36! You should be able to do it! Kenny, in the phone: Pwease! For Christmas! XLR8 sighs, then runs back home. He stuffs Kenny in the toilet. Meanwhile, Steve, Ben 23, Ahmad and Gwen are walking through the snow. Gwen: We should find shelter. Steve: Oh, I know where we can go! Steve grabbed them and took them into a secret cottage. Steve knocks on the door. Groot opens the door. Ben 23: You are Groot! Groot smiles, and invites them in. Ben 23: He said "Merry Christmas!" so I said "Merry Christmas!" Ben 23: Groot has his own language. Ben 23: How can you not understand? Groot takes them to the living, where Greg, Rowley, Olaf, The Gingerbread Man, Zac Efron and a bunch of others who aren't important are. Olaf walks up to them. Olaf: Hey guys! I'm Olaf and I like warm hugs! Ben 23 transforms into Charcoal Man and burns him. Ahmad: Poor guy. He never hit puberty. Steve: :O HOLY UPGRADE! IT'S ZAC EFRON! Steve hugs Zac Efron and cheers. Zac: Is he always like this? Back with Ben, he is battling elves out of nowhere in the middle of a snow field. Ben: Where'd these elves come from?! He transforms into Upchuck, and extends his tongues. He eats a random trash can. Upchuck: Ah, trash, my favorite dish! He poops out an explosive poop projectile, which hits an elf. He dies of the smell. runs up a platform, and poops out more mines. Abraham Lincoln: There is always a need for rich storylines. Such needs are rarely satisified. Upchuck: Where'd you come from?! Abraham Lincoln: That would be telling, my dear Benjamin. Abraham Lincoln: This is rediculously unbearable. My leaving is inevitable. Suddenly, a strong wind blows by, and Appa lands in, with Zac Efron, Steve, Ahmad, Ben 23 and Gwen. Zac Efron: Two of those...? Ahmad: Oh, believe me, I'm surrounded by morons. Even you are a moron. Gwen: Ugh, why did we even come here? Ahmad: We are going to the North Pole, which we just are arriving in. Gwen: Wait how come we went from America to France to Greenland in one hour? Zac Efron: As my unworthy rival, Selena Gomez, would say, "Its magic!" Gwen: And I thought I'm the one with magic powahs. Gwen rages into her Anodite form. Gwen: WHAT DID YOU JUST CALL ME?! Ben 23: Why is this place even called Greenland? I never saw a single grass thing here. Steve: I blame the vikings. In Asgard, Odin stands up, angered. Odin: How dare you insult us?! Thor swings his hammer. Meanwhile, lightning strikes Steve. He is now covered in ashes. Ben 23: Meh. Blueland has more blue. They continued walking, and arrived at.. The whole place was Christmas-y. Snow everywhere, elves, chimeny houses, christmas trees, you get the idea. Gwen, Ben, Ben 23, Steve, Zac Efron and Ahmad walk over to them. Gwen: Yeah, and we are a bunch of unnamed filler characters. Elf #2: Oh, appologies, Ben Tennyson's sidekicks. Ahmad: ...that's even worse. Y'know, I only came in here to fill up a role. Elf #3: Well, we'd love to give you more hospitallity, but we are under invasion of the EASTER EMPIRE!!! Easter Bunny soldiers attack, raining down explosive easter eggs, and peach pies. Elf #4: I"M ALLERGIC TO PEACH PIE! He dies as a peach pie hits him in the chest. He hugs the Easter Bunny. It growls, and kicks him off. Ben: I wish I can do dots like that. Easter Bunny Leader: THEY ALWAYS STOLE OUR HAPPINESS, FRIENDS AND FAMILY GATHERINGS!! Ben: Christmas isn't about friendship and family ties. Christmas is about getting the best Christmas gift EVAH. Easter Bunny Leader: IT'S ZAC EFRON! CAPTURE HIM! He is enveloped in dark orange red light, and transforms into: Duc Efron, a roasted duck hybrid with long legs, and a superhero custome. Duc Efron fires roast rays at some Easter Bunnies, turning thm to Roasted Dunnies that fight by his side. He kicks an Easter Bunny in the neck. He deflects an explosive Easter Egg with his beek. He kicks an Easter bunny in two. Ahmad: Meh. I could do better as Grey Matter. Steve: Let's join in the fight! Steve transforms, in an epic transformation sequence. becomes Upgrade. He merges with an insect and fires laser beams from his biological clock. He slaps down the Strike Omnimatrix, transforming into Spidermonkey. Ben 23: Right behind you! Guy on Telecom: Hi! Are you Ben 23? Guy on Telecom: You have just won a million dollars! Guy on Telecom: There is only last thing you need to hear. Guy on Telecom: PSYCHE! YOU'VE BEEN PRANKED! Ben 23's phone rings again. He answers it. His leg comes out from the phone and kicks Ben 23 off a cliff. Spidermonkey (Ahmad) is thrown the air and lands next to him. Spidermonkey: We'd appreciate it if you just came over and helped us out! In the background, an Easter Bunny bangs his head into Upgrades. Upgrade "OUCH!"s. An Easter Bunny bangs his head into Upgrades. Upgrade "OUCH!"s. An Easter Bunny bangs his head into Upgrades. Upgrade "OUCH!"s. An Easter Bunny bangs his head into Upgrades. Upgrade "OUCH!"s. An Easter Bunny bangs his head into Upgrades. Upgrade "OUCH!"s. An Easter Bunny bangs his head into Upgrades. Upgrade "OUCH!"s. Spidermonkey: Well, do something! ANYTHING! He is suddenly grabbed by an Easter bunny and beaten up. Abraham Lincoln: I do not recall why I did ever join your quest. Abraham Lincoln: Grunt. I must disappear to escape this meaningless tormentation. He teleports away in purple smoke. Ahmad: Ugh, I wish he took ME with him. Ben: Why should we be bored? WE CAN SING CHRISTMAS SONGS! JINGLE BELLSSSS!!!! As he says that, it echoes across the empty room. A cricket noise is heard. Ahmad: Ugh, face it. We're trapped. And we're left to die of boredom. Steve: Nah, who said that? We have Zac Efron! Zac Efron: I have always hated Justin Beiber. Ahmad: WHY THE HELL DID WE EVEN BRING THAT GUY IN THE MOVIE IN THE FIRST PLACE?! We ran out of ideas. Ahmad: Seriously?! I'm suing you! Ahmad is thrown in the lava, but miraclously survived. Damn it. That guy is smart. Ben: Yey, I saved the day! The ground rumbled, and everyone was back above the ground, where Santa was chained, with the Easter Bunny standing nearby. Easter Bunny: And now, I shall kill your adored Santa! Easter Bunny: Well, he won't be real for long! Ben: (transforms) Bullfrag! I haz swag! He killed the Easter Bunny. Santa Claus: But you're not done yet! Gwen will still die! Steve: Oh no! We need to get Kevin! Ben: I can be her true love! Prince Philip rides his horse in. Ahmad: Quit the songs and just kiss her already. Prince Philip kisses Gwen. She doesn't wake up. Steve: Santa, we wish Gwen is cured! Santa: Lolhohono. Its a spell. So only a true love's kiss can save her. Steve: Come on, Santa! You can help her! Santa: Lolnope. I'm being a jerk. Ahmad: See? We should've asked Hex. The wall explodes. Kevin bursts in, riding a golden horse. Rook comes, too. Ben: Oh no, anyone but him! Ahmad: At this point, we're desperate. Santa: You HAD to destroy the wall?! Santa: You're so on my naughty list. Kevin: Yeah, cool. I don't care about Christmas. Steve: Hurry, Curtis, Gwen's dying! Kevin ran over and kissed her on the lips. They continued to kiss grossly. Kevin then stands up, and smiles. But nothing happened. Kevin: WHAT?! BUT SHE'S SUPPOSED TO LIVE! ITS TRUE LOVE! Lolnope. Not that kinda true love. Ben: Well, what kind of true love?! Easter Bunny Leader bursts up, very much alive thank you. Easter Bunny Leader: I'm alive! He presses a button, and the wall flips over to now include also Ken, Gwen's brother and Barack Obama chained next to Santa. Easter Bunny Leader: One more move and I will turn them into fireworks! She transforms into her Anodite form and turns Easter Bunny Leader to vapor. Kevin: What the hell? Sisterly love?!!! Rook: I have seen everything. Ahmad: Ugh, this is so stupid it is insulting. Ben 23 is listening to a song on his Hero Pod. Santa Claus: Well, merry Christmas everyone! Fireworks occur in the sky, and everyone cheers. Santa Claus: yay now everyone go home. He puts Rook, Ben 23, Steve, Zac Efron, Abraham Lincoln, Ahmad, Kevin, Gwen and Ben in a catapult and launches them off. Santa sighs in relief as the entire village shuts down. Santa: Eh, finally. That was tiring. He goes home. Meanwhile, Gwen, Ben, Ben 23, Steve, Ahmad, Kevin and Rook are around the Christmas tree. Grandpa Max is there too. Max: And now, merry Christmas! Ben: Yay, time for the gifts! Ahmad: I got clothes again. Kevin: I'm on the naughty list. Gwen: That's why I love you. Rook gets a mega sandwich. Rook: Too bad I am on a diet. He throws it in the trash. Steve gets a complete series of cool DVDs. Ben 23: Yay, I'm even more famous. More streetlights point at him. Ben: My turn! What did I get? He opens his present. gas suddenly reeks out of it. Santa is putting stuff in their present boxes. Santa: Ben Tennyson's turn! AHA! He turns around and sits on his present box. Santa: Hey, elf, pull my finger. Elf nods and does that. A noise of farting is heard. Ben: CURSE YOU, SANTA CLAUS!!!!! Gwen (offscreen): Hey, I think we're forgetting something. Meanwhile, Ken, Abraham Lincoln and Barack Obama are still trapped in Santa's Noelville. Ken: HELLO? ANYONE HERE? HELP!!! Abraham Lincoln: Well, old friend Barack Obama, I fear it is time for our departure. They both teleport out, leaving Ken alone. The screen begins to shrink into a circle, when suddenly, Ben dashes in, holding it open and transforms into Kickin Hawk. Kickin Hawk: KENTUCKY FRIED KICKIN HAWK! He grins wickedly, as the screen shrinks for real. An explosion noise is heard. Santa Claus (offscreen): CURSE YOU, BEN TENNYSON!! !